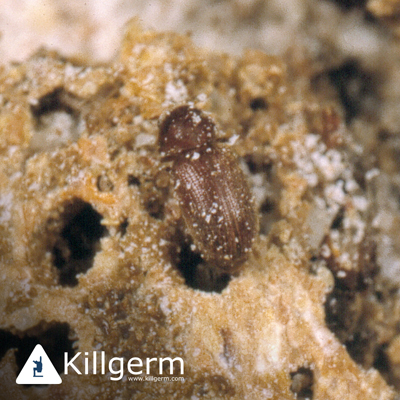 The biscuit beetle (Stegobium Paniceum) is one of the food industry's main insects. The Biscuit Beetle is found worldwide, but more in temperate areas like the UK. It is found mainly in food areas such as domestic food cupboards and food warehouses and establishments. The adult female lays eggs (larvae) amongst the foodstuff and then the larvae crawl or chew through most packaging materials to feed. After a period of about two months the larvae turns into cocoons and then one or two weeks later the adults hatch. Their holes resemble 'woodworm' exit holes. Mating takes place shortly after and they survive for about a month. One of the signs of infestation is usually the presence of the beetles or the larvae or cocoons. Other signs are packaging being eaten, with hard material appearing to be eaten through. The biscuit beetle can be classed as a pest due to how widespread it is; how it can travel; and the way it can get through most forms of packaging. It is more common in smaller establishments and domestic larders - this leads to often massive infestations in old out of date packets of foods. A way of control is to remove and destroy infested materials, and get rid of the rest with professional fumigation of bulk foods. Also improve hygiene standards. We do not treat biscuit beetles. You can find other professionals that are able to treat an infestation online or in a local directory.